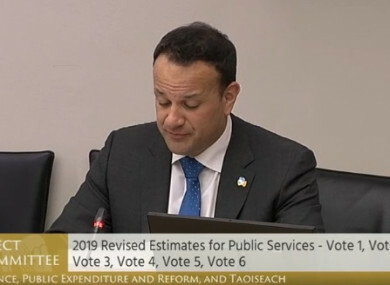 DURING A RARE appearance of the Taoiseach in an Oireachtas committee this week, Leo Varadkar was told that the “banks are as aggressive and as arrogant as the time of the crash”. Fianna Fáil’s John McGuinness said he wanted to use the opportunity to tell the Taoiseach that his government is doing little to help the thousands of people in bad mortgage situations. Homeowners dealing with vulture funds “have been put through the ringer”, McGuinness told Varadkar as he appealed to the government to recognise this “in some way, shape or form”. McGuinness said the government often states that there are regulations in place to protect householders, but, he said “there isn’t really in practice”. Countless mortgage-holders have appeared before the committee to tell of their struggles dealing with vulture funds and banks, he said. He asked the Taoiseach if he had any analysis of the effect vulture funds and banks are having on society and on families, adding that he wasn’t talking about the financial aspect of it, but the human impact. In his reply, Varadkar referred to the Central Bank research paper on the code of conduct for mortgage arrears, which inspected the outcomes of customers dealing with vulture funds and banks. Following the publication of the report, intermediaries that work on behalf of vulture funds escaped tougher regulations with the Minister for Finance Paschal Donohoe recommending that the status quo be maintained and that no changes be made to the current code on mortgage arrears. It has since been confirmed that no firm acting on behalf of a vulture fund or bank has ever been sanctioned for a breach of the current code of conduct which sets out how lenders must treat borrowers in a fair and transparent way. Varakar said the report was a “very good piece of work” and “tells a more nuanced” side of the story. He said the “bigger picture” has to be considered. He said hundreds of thousands of people are paying higher mortgage interest rates than are in place in other European companies, acknowledging that this is partly due to the lack of competition in the Irish market. Varadkar said he has to consider the “wider society impact before we do anything in this space”. He added that his government has accepted Fianna Fáil’s Bill dealing with vulture funds, which means they can be directly inspected and investigated by the Central Bank. He said Minister Kevin ‘Boxer’ Moran’s Bill will also ensure that the courts have to give consideration to family circumstances before evicting someone from their home. McGuinness said he disagreed with the Taoiseach on the matter, stating that vulture funds are “extremely difficult” to deal with and are “becoming even more difficult to deal with”. “Banks are as aggressive and as arrogant as the time of the crash,” he added, saying that “people who want to pay and want to engage with their banks, in spite of what the banks will say about engagement, the banks are not engaging”. The Fianna Fáil TD said it was important to take into account the commentary from the individuals who have appeared before the committee and from the “many thousands who are caught up in bad mortgages and their cry for help… they are saying it is non-engagement on the side of the banks”. Email “Taoiseach told that 'banks are as aggressive and as arrogant as the time of the crash'”. Feedback on “Taoiseach told that 'banks are as aggressive and as arrogant as the time of the crash'”.